Are the cold winter temperatures getting you down? It’s never too early to start planning a warm weather getaway to Saugatuck. Saugatuck and the surrounding area are filled with countless amazing outdoor adventures for nature lover’s of all stripes. After a winter spent cooped up inside, hikers, cyclists, bird watchers, and watersports enthusiasts will find plenty to love about Western Michigan. There are also great opportunities for cross-country skiing or snowmobiling nearby, if you prefer winter activities. From coastal sand dunes to scenic viewpoints, here are our favorite outdoor activities in and around Saugatuck. Mount Baldhead Park offers some of the best views in the region, if you are willing to climb. Take a hand-pulled chain ferry across the Kalamazoo River and then ascend 302 steps to the top of Mount Baldhead for a breathtaking panorama of Saugatuck, Douglas, and Lake Michigan. Mount Baldhead also includes a pleasant one mile loop used for hiking, walking, and trail running. No trip to Saugatuck is complete without checking out its incredible sand dunes. The best place to go is Saugatuck Dunes State Park, which features 2.5 miles of secluded beach and 200-foot tall wooded dunes. You’ll find four trails, ranging from 2.5 miles to 5.5 miles, of varying terrain, including both steep slopes and rolling hills. For a fun and unique way to explore the dunes, consider Saugatuck Dune Rides. Saugatuck Dune Rides re-opens in May and takes guests on 40-minute, adrenaline-pumping adventures through some of the area’s finest dunes. And of course, Saugatuck is filled with many pristine beaches ideal for long walks as well as swimming, boating, kayaking, and more. Oval Beach, Pier Cove Beach, Douglas Beach, and Laketown Beach are all great places to explore. Big Lake Outfitters is our go-to spot for outdoor gear and and rentals. They offer kayak, bike, and pontoon rentals as well as excellent fishing tackle and gear. They also offer chartered fishing trips, giving you the perfect chance to hit Lake Michigan and catch some salmon, trout, walleye, and smallmouth bass. We recommend making the roughly 40-minute drive to Olive Shores County Park, a wooded, 20-acre site that boasts a mature beech-maple-hemlock forest, a steep dune formation, and lovely Lake Michigan frontage. The nearby town of Grand Haven offers ample opportunities for birdwatching, biking, hiking, watersports, and more. On the Riley Trails, you’ll find 300-acres of rolling terrain, beech-maple forest, plantations, and a small lake. The informal trail system is a popular spot for hikers, cross-country skiers, and mountain bikers. Head to the Eastman Bayou for 1.77 miles of Grand River frontage and wetlands as well as a bayou and floodplain forest. The lovely and peaceful Musketawa Trail was constructed from an abandoned rail line stretching between Marne and Muskegon. It is 26 miles in total and can be explore by hiking, biking, rollerblading, snowmobiling, or horseback riding. 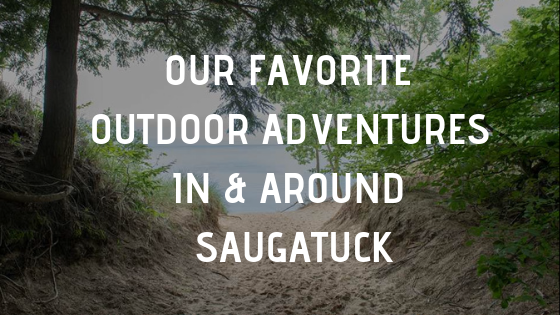 Planning an outdoor adventure in Saugatuck Michigan? Book a stay at the Twin Oaks Inn, a charming bed & breakfast located in an elegant Victorian home.